One of the inn’s main features is its surrounding green areas. 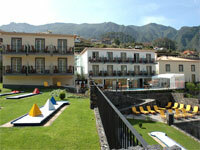 It is located in one of the most beautiful parts of Madeira. From one of the hotel’s belvederes, you can appreciate the full splendour of the S. Vicente valley and the deep blue shimmer of the north Atlantic, with all its magic and connection to the enormous mountains.